I saw the movie of this same name (starring Clive Owen) a couple years ago when it came out in theaters. I vaguely remember it as a dystopian story featuring a very graphic birth scene, coming horrifically close to the birthing videos one would watch to get an EMT license. Recently, one of my Facebook friends commented that the movie was a travesty of the original book, that the altered screenplay had stripped away most of the Christian themes that the author P. D. James had penned. That comment intrigued me. How was the story in the book different than the plot of the movie? 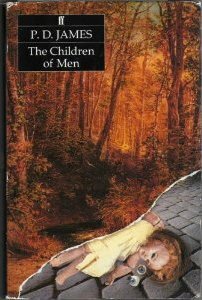 The book’s title, The Children of Men, is a direct allusion to Psalm 90: 3, “Thou turnest man to destruction; and sayest, Return, ye children of men.” The year is 2021, the setting is England, and mankind has indeed been turned aside to destruction. The human race has lost the ability to reproduce; for a quarter of a century, all male sperm has been infertile. The last children to be born left the womb in 1995, a year that has come to be known as “Omega,” the end of all things. A world without children is a world without a future and a world without hope. The best that the aging population can hope for is to live in comfort and prolong their lives as long as possible. A dictator named Xan has taken control of Britain, trying to maintain a stable society through questionable means. All criminals are deported to the Isle of Man, where they can brutalize and victimize each other as much as they please (and leave the decent citizens alone). Since the country needs young, able-bodied workers, Xan allows foreign Omegas–the generation born in 1995–to enter the country and work as slaves. Called “Sojourners,” these foreign Omegas have few rights and must leave Britain at the age of 60 before they can become a drain on the country’s resources. The octogenarian British, although indigenous to the country, are also perceived as a burden to society. They are encouraged (or perhaps coerced) to partake in a mass suicide ritual known as the “Quietus,” where they are sent out in a boat and drowned. Xan’s cousin Theo is the main character, and occasionally the narrator, of this story. Theo is a teacher at Oxford, but with no young people to teach, he lectures to middle aged folk who want to escape the present reality by living in the literature of the past. A woman named Julian approaches Theo, asking him to help a subversive group known as the Five Fishes. The group would like Theo to intercede with his cousin Xan to change his policies regarding criminals, foreigners, and the aged. Theo agrees to help, but doesn’t get very far with convincing Xan or his council of advisors. The second half of the story, titled “Alpha,” begins when Julian sends word to Theo that she needs him desperately. Xan has captured one member of their group, and when tortured, he is sure to reveal the identities of the others. Theo goes to Julian’s aid and learns the real source of her urgency–she is pregnant! Astounded at this miraculous conception, Theo helps Julian and the rest of the group run from the secret police. Julian is convinced that Xan will either try to kill her and the baby or else take the baby to use for his own purposes. The safe birth of the child is all important, for on that hangs the future of the entire human race. As the group flees through the forests of England, one of their number–Luke–gives his life to save the rest. Theo learns later that Luke was the father of the child that Julian carries. As Julian’s contractions begin, they find their way to a deserted shed. But Rolf, a member of their group, has betrayed them and Xan is close on the trail. Theo, confronting his cousin outside the shed, does what he must to protect the child, and in the hour that the child is born, the country of England becomes free again. After I finished this book, I was a little bit confused about whether it was a Christian story or not. There were a lot of Christian allusions and borrowed names, but I couldn’t pin down exactly what the whold thing meant. Upon consulting several reviews of the story, I found that P. D. James intended the story as a sort of Christian fable or allegory. The boychild who is born is Christ; his mother Mary (Julian) flees from the evil king Herod (Xan). After his birth, the magi (Xan’s council) come and view him with wonder. The name of Luke, the father of the child, hearkens back to the third gospel, the one with the fullest telling of the Advent story. And as you recall, the gospel of Luke was addressed to Theophilos (Theo). I found it an interesting play on words that the Isle of Man was the place of total depravity and corruption. So, as an allegory, it does tell a Christian tale. However, if you take the novel as a novel and not as an allegory, then it becomes an interesting and depressing commentary on power and the corruption that it brings. Throughout the book, Theo speculates about Xan’s motives in becoming dictator. In the beginning, Xan seized power because he thought it was the only way to bring stability to the country. Even now, he was convinced that everything he was doing (even the Quietus) was for the greater good of society. Theo recognized that the power had warped Xan’s perspective, and like Tolkien’s One Ring, was something he could not bear to give up. Throughout the book, Rolf–one of the members of the Five Fishes–wants to depose Xan, but more from feelings of envy than anything else. Rolf craves the power that he decries in Xan, and he hopes to use the birth of Julian’s child to take control of Britain for himself. Theo calls Rolf on the carpet for this scheme, arguing that Xan started out with good intentions too. At the end of the book, after Theo kills Xan, he picks up the royal signet ring that Xan has appropriated for himself. In order to keep the council from harming Julian or the child, he realizes that he needs to assume the mantel of authority. Theo will become Xan for a time, just to keep things stable and safe. This gave a very sinister feeling to the denouement. Just what exactly will Theo become now that he has taken the reins of power? Will he be able to give up the dictatorship once it is no longer needed? Whether or not you consider The Children of Men to be a Christian story, it was an interesting snapshot of what the future might be like, reminiscent of Brave New World or 1984. If you’ve read it, tell me what your take on it is.